A view of the shuttle Columbia as it soars beyond the launch pad into space on its STS-1 mission on April 12, 1981. This flight marked the beginning of NASA's space shuttle program. NASA's space shuttle program may be coming to an end later this year, but the agency's fleet of orbiters is preparing to celebrate an important milestone next week – the 30th anniversary of the very first space shuttle flight. 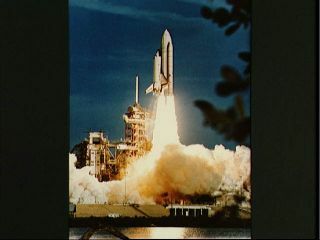 On April 12, 1981, the shuttle Columbia blasted off from NASA's Kennedy Space Center in Cape Canaveral, Fla.,on the program's inaugural STS-1 mission. Thirty years later, the workhorse shuttles have played an instrumental role in constructing the International Space Station, launching critical satellites and observatories into orbit — including the prolific Hubble Space Telescope — and carrying numerous supplies and science experiments into space. Hale joined NASA in 1978 as a propulsion officer at the Johnson Space Center in Houston. He then worked as a flight director in Mission Control, presiding over 40 shuttle flights before becoming manager of the program in 2005. Hale played a critical role in the agency's recovery from the catastrophic loss in 2003 of the shuttle Columbia and its seven-astronaut crew. He now serves as Director of Human Spaceflight Programs at Special Aerospace Services, located in Boulder, Colo.
Wayne Hale, NASA's former shuttle program manager, is pictured during a 2005 briefing previewing the agency's STS-114 return to flight mission. With the 30th anniversary of NASA's space shuttle program just around the corner, SPACE.com chatted with Hale about his memories of the first flight, the legacy of the program, the safety of the shuttles and what excites him about the next 30 years of spaceflight. SPACE.com: With the 30th anniversary of the program coming up, and as we inch closer to the retirement of the space shuttles, what is this time like for you? Hale: I think it's definitely a bittersweet moment. The shuttle has had an amazing run for 30 years, and I certainly think the old workhorse has got more miles in her if we need it, but it's way past time that this nation developed a new set of space vehicles, and we'll be able to do even greater things. SPACE.com: Do you recall where you were the first time Columbia launched in 1981? Hale: Oh, absolutely. I remember exactly where I was. I was on the Mission Control team. I was working on the propulsion team – we were responsible for the operation of the maneuvering rockets and the attitude control rockets. I worked the countdown and pre-launch shift, and came home and grabbed a few hours of sleep. My wife woke me up when the countdown got down to the bottom line, and I watched the launch on television and then got up and got ready to take another shift in Mission Control. I have extremely vivid memories of those days. SPACE.com: What was that experience like – knowing that you were witnessing the first launch of the vehicle? Hale: I was just amazed. I hadn't really seen a solid rocket motor fly – I mean, I'm sure I saw pictures of the test or something, but to see those guys light up and the vehicle just leap off the pad, that was just amazing. The Saturns – or going back further with the Titans that flew our astronauts earlier – were very slow to get off the pad, and it just seemed like they crept up those first few seconds. The shuttle leapt off the pad and was headed out of town as fast as it could. It was really amazing, and television doesn't do it justice. You have to be there in person to witness it– it's just something we can't capture with our current technology. SPACE.com: What would you consider to be the greatest achievements from the space shuttle program? Hale: I would say the construction of the International Space Station, which has brought a number of nations of the world together. Some people call it the biggest international engineering project that has ever been completed. It certainly took a lot of work, and not just in the engineering sense, but in the diplomacy and the intergovernmental discussions to get the project together. The International Space Station will continue another 10 more years, and probably beyond that, to train our astronauts for long duration flights to Mars and other places in the solar system, and to test out new technologies. Then, of course, the science work that goes on there – who knows what we may unlock aboard the International Space Station. SPACE.com: What do you hope will be the enduring legacy of the shuttle program? Hale: I think the enduring legacy of the space shuttle will be the knowledge we gained that will help us to build even more capable launch vehicles and spacecraft, and hopefully we'll see a lot more space launches in the future. I'm sure we will take the knowledge that we learned from the shuttle and apply it and do even more flights, and maybe get it to be a more regular thing. SPACE.com: What is your vision for the next 30 years in human spaceflight and exploration? What are some of the things you hope will be accomplished? Hale: My vision hasn't changed from when I first saw that Collier's magazine spread as a child. We all want to go back to the moon, permanently this time, then on to Mars and explore the entire rest of the solar system. And the only question is the timeline. I came to work for NASA in the late '70s, and I thought we'd do the shuttle thing for a couple of years and be on our way to Mars. It didn't quite turn out that way, not because we couldn't do it, but because we as a nation couldn't reach a consensus to politically do it. And now I'm very hopeful that in the next 30 years, many of these things will come true. I'm very excited about the future. SPACE.com: Are there any specific upcoming missions that you're excited about? Hale: I was just out to see the folks that are doing a review of the Juno spacecraft that is going to the outer planets – out to Jupiter and so forth. I think it's going to be a great adventure. I think the James Webb Space Telescope is going to find things that Hubble is not big enough to see, and you know how amazing Hubble has been. So, I think there's a lot of things to be excited about. SPACE.com: What about with the current landscape of commercial spaceflight? From your vantage point, are we where we need to be at the moment? Hale: Well, from my standpoint, I don't think we're where we need to be, because I wish they were all flying today. This is very comparable to what they used to call the "golden age of aviation" in the 1920s, when many private firms were competing to build airplanes and establish airlines, and I think we are just now entering that phase. Once a profit-making business is established, I think we'll see it explode – this whole idea of sending more and more people into space. I think it has a bright future. We obviously have a lot of technical, financial and other problems to overcome in the next few years, but none of them are insurmountable. SPACE.com: What are some of the major lessons that these private spaceflight firms can take away from NASA's space shuttle program? Hale: I think the major thing they can take away is that eternal vigilance is required. They say that even when you think you understand your spacecraft very well, you have to pay attention to the details, and you can't let anything slide. And if there's anything that the space shuttle program taught us over and over again, it's that in this very unforgiving environment, you have to be vigilant, or else things come out of the woodwork and get you. SPACE.com: On that note, when you look back at the program as a whole, and particularly at the two very tragic accidents, do you think the shuttle was ever a truly safe vehicle? Hale: Space travel is not a safe thing, and not just with the space shuttle, but every other space vehicle that exists, and even ones that are still on the drawing board. If you want safe, stay in bed. In terms of safety of the shuttle relative to other space vehicles, I absolutely wish the original designers had included a launch escape system. They thought that the shuttle was going to be like an airliner, which was an overly optimistic point of view. It's like trying to build a 707 in 1925 – the state of the art just isn't there yet. And then we ignored the hazards that we had to our thermal protection system and heat shield. Most of the designs I see now have taken the lessons we learned and applied them to the heat shield, to make sure it's protected and inspected and ready for re-entry before folks commit to that very hazardous journey. Somewhere along the way, it got into the conventional wisdom that flying in a space shuttle was as safe as going down to the airport and jumping on a scheduled airline to go see grandma on the other side of the country. And it has never been that safe. Those of us inside the program knew we were at grave risk every time we flew a flight, and will continue to be at grave risk every time we fly. The next generation of space vehicles, if they're done properly, will be safer, but they will also carry a grave risk. And no one should forget that. There's not anything out there on the drawing board that is risk-free. And it takes attention to detail and vigilance, and really a strong team, to look at all of the things that are going on in the program to ensure safety. NASA cut back on safety. It cut back on safety once and had an accident, and a presidential commission said,Don't cut back on safety. And for a few years, we were all very vigilant. And then the pressures of the day got onto us and once again, we cut back on safety, and we paid the price for that again. There is no such thing as unavoidable accidents. Every accident has a cause and, if it had been foreseen at the right time, could have been avoided. So my response is, we got off with the success rate that we deserved. If we had invested more either in the development or the actual operations, we might have had a perfect batting record. But we didn't. And I lost good friends on both of those missions, and it's painful to think about, but both of those accidents could have been avoided. SPACE.com: The space shuttles have obviously accomplished a great deal, but with their impending retirement, do you think the program really lived up to all of its potential? Hale: It depends on whether you consider the potential as what it actually is capable of, or if the potential is what was hyped during the sales phase in the 1971-1972 timeframe. We clearly never achieved the economy and flight rate that was discussed in the early '70s. But, given the vehicle that we actually built, it certainly has lived up to its potential. When they said they were going to fly them more than once a week and so on and so forth, well, that was for a very different vehicle concept than what Congress and the Office of Management and Budget allowed NASA to actually build. Given the leap in technology on the heat shield and thermal tiles, the shuttle has really been a workhorse, and has done outstandingly well. In that sense, if you look at what we actually got out of the development process, it's really exceeded all expectations because we really have been able to do things like build a huge, complicated space station, and do all sorts of experiments. SPACE.com: What is your most memorable moment from your time as the shuttle program manager? SPACE.com: What do you think will be going through your head as you watch the very last shuttle launch? Hale: If I'm down there watching it, it's always, "Wow." It's just incredible, and any other thoughts about it being the last one, and sadness or anything – that will come well after they're out of sight and over the horizon. I think it will probably hit after wheels stop. That will make me very sad indeed. SPACE.com: Finally, I have to ask: Do you have a favorite shuttle? Hale: No, no (laughs). You know, I see people, and they ask, Well, which one do you like better? To me, they are all incredible vehicles, and they have differences and similarities. I don't have a favorite, no.